Jerusalem is recovering. After the intifada of the past five years kept foreign tourists away from the capital, a nearly 50 percent increase in hotel occupancy was recorded over the past year. The encouraging data were presented ahead of Jerusalem Day, celebrated Thursday and marking 29 years since the reunification of the city. On the other hand, data published by the Jerusalem Institute for Israel Studies and the Central Bureau of Statistics reveal that the percentage of Jewish residents in Jerusalem continues to decline. 1967, they year Jerusalem was reunified in the Six Days War, until today, the city’s population grew by 170 percent. The number of Jews is greater than the number of Arab, but there has been a consistent decrease in the proportion of Jewish residents. For comparison, in 1967 Jews constituted 74 percent of the population, while by 2004 that number dropped to 66 percent. The number of Arabs (Christian and Muslim) increased consistently throughout that time period. At the end of 2004, some 414,300 (59 percent) of Jerusalem’s residents lived in neighborhoods incorporated after 1967. Of those, 44 percent are Jewish (82,000). Jewish neighborhoods in zones appended in 1967, Ramot Alon, Pisgat Zeev, Gilo, Naveh Yaakov, Ramat Shlomo and East Talpiyot, are home to 147,000 Jewish residents. In 2005, a 48 percent increase in the number of tourists (from both Israel and abroad) staying in Jerusalem hotels was recorded – 2,930,100 tourists in 2005 compared to 1,981,200 in 2004. 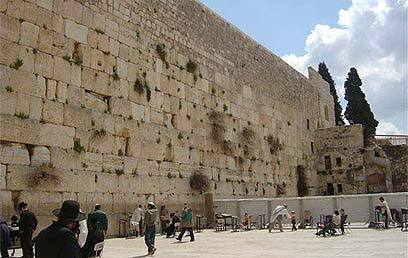 Israeli tourists who spend their vacations in the capital rose by 27 percent. Hotel profits, in parallel, leapt 32 percent. Jerusalem’s education system is the largest and most complex in the country, and over the past school year, no less than 217,000 students were matriculated. Of those, 62,200 studied in the Jewish public and religious-public school system, 48,400 in the Arab school system, and 85,000 in the Orthodox school system. An additional 20,000 study in private Arab institutions, church schools or Wakf-run educational programs. Among Jewish high school seniors, 54 percent of students earned certification in their matriculation exams (not including Orthodox students, who don’t take the exams). In comparison, in Tel Aviv the number was 62 percent, and in Haifa 64 percent. The equivalent Arab sector exam certified 59 percent of students. See all talkbacks "Jerusalem: More tourists, fewer Jews"